This month sees the 11-month anniversary of our Sidonge Pilot project – one that has been very rewarding and full of interesting lessons learned. This is part of a series of articles covering our observations and will cover clean water consumption, impact to health, job creation and improved school results. In a previous article, we outlined how KUDURA makes potable water from the local Sidonge ground water which has been documented to contain Typhoid, Bilharzia and other nasties. The poorest villagers use raw water from the shallow wells and river in the village as indicated in the picture at right. The few upper income families rely on piped water from a Government sponsored water project that pipes water to some homes. Water is available less than 10 days a month and as such is an unreliable source. Sidonge shallow water well – would you drink it? Initially we had our resulting potable water and the original source water tested by the Kenyan Ministry of Public Health and Sanitation – the results were awesome – the report can be viewed by clicking this link. Note that this water was purified from water that came from this source at right. Hard to believe, not true? Given access to Kudura potable water from a central point in the community, many families opted to pay for the piece of mind and associated reduced medicinal costs caused by consumption of this raw water. Consumption however declined in the rainy season as many families would capture rain water run-off from their roofs for drinking. We experienced an anomaly from July to September 2012 where consumption dropped significantly – initially without explanation. 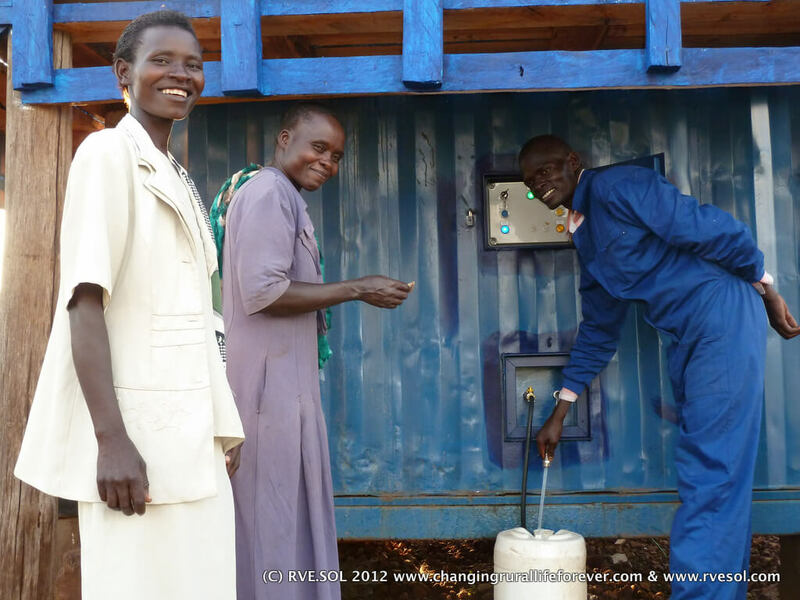 Subsequently we discovered that the energy vendor was misappropriating funds and that the community members did not trust him – as a result, they stopped buying water. Finally, his services were terminated by the community self help group and a new individual called Geoffrey Okumo, hired. Almost immediately, villagers started buying water again. 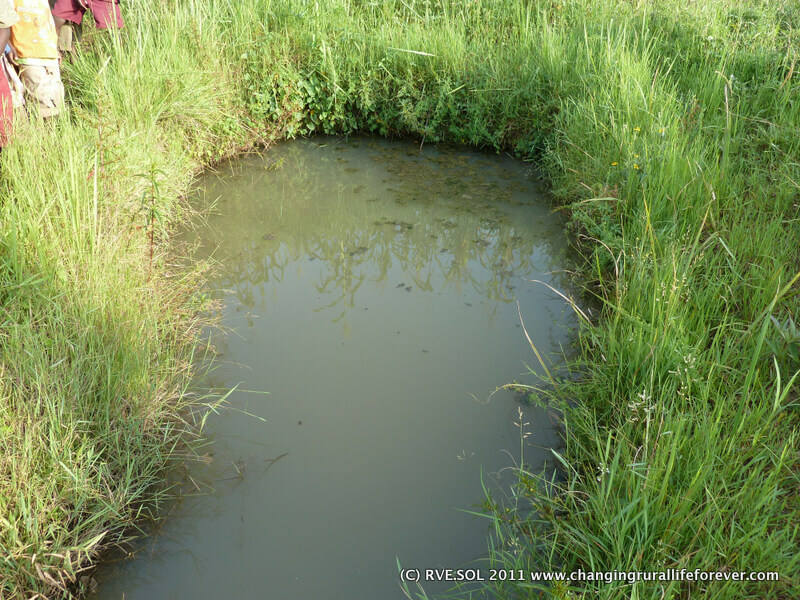 [singlepic id=269 w=320 h=240 float=left]It is interesting and important to note that our sustainable development model enables a number of ancillary income opportunities for villagers, whether they choose to consume the potable water or not. Every day around 5pm, after school, children check with the energy vendor as to whether more raw water is required. Most days it is and they set out to the raw water source, jerry can in hand! On returning with a full 20l jerry can, they are paid by the community-run project fund, earning 5-7 shillings per jerry can. Some students are clearing 50 shillings a day! This money is being used to buy materials for school like pens, notepads and the like. In a subsequent article we’ll see a family video interview in which the family is convinced that the income from raw water collection tied to light at night to study has had a tangible impact on school results over the last year. We’ll be conducting a follow up social impact study late this year, the results of which we will happily share. Subsequent posts will cover Energy for light and communication, Energy for cooking and use of bio-fertiliser for rejuvenation of over-utilised land for crops. Thank you for your interest Philip. We’d be honoured if you included info about our project in your material. In terms of resources, what did you have in mind? Keep up the great work! You know, lots of individuals are searching round for this info, you could aid them greatly.